Control of the office thermostat – an office debate that has probably existed since the first one was installed – becomes even more "heated" in humid Washington summers. Too hot or too cold – there is no pleasing everyone, but while today the AOC provides a climate-controlled environment to the buildings of Capitol Hill, two centuries ago this wasn't the case. Although construction of the U.S. Capitol Building began in 1793, a number of problems had required the builders to only focus on finishing the north wing in order to meet the looming deadline. Congress, the U.S. Supreme Court, the Library of Congress and the District of Columbia courts were all forced to occupy the cramped north wing in late 1800. In order to alleviate these overcrowded conditions, on June 1, 1801, President Thomas Jefferson approved the board of commissioners' plan to build a temporary chamber on the foundations of the south wing that had been constructed between 1793-1796. The temporary chamber within the north wing would no longer be large enough for the additional new members that would be added following the 1800 census. Congress then signed a $4,789 contract on June 20, 1801, to build a temporary chamber for the House of Representatives. Following the contract award, the building was hastily constructed as an elliptical room with poor ventilation. At times, members of Congress missed votes due to the "suffocating feeling of the air in the Hall." It earned the nickname "the Oven." The temporary House Chamber, or "oven," on the left was joined to the north wing on the right by a low wooden gangway. According to William Allen, Architect of the Capitol historian emeritus, in The History of the United States Capitol: "The nickname was bestowed because of the structure's shape, which reminded some of a huge Dutch oven, and partly because of its notoriously stuffy interior." 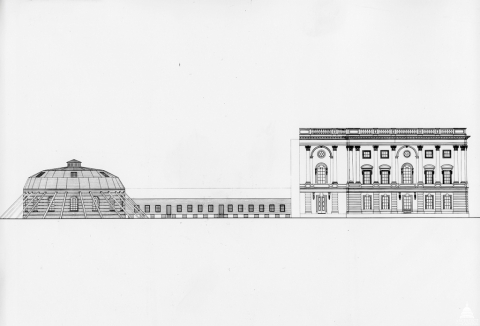 In March 1803, President Jefferson approved an appropriation to build a new south wing and under the direction of architect Benjamin Henry Latrobe, a new chamber (today's National Statuary Hall) would eventually replace the Oven in 1807.